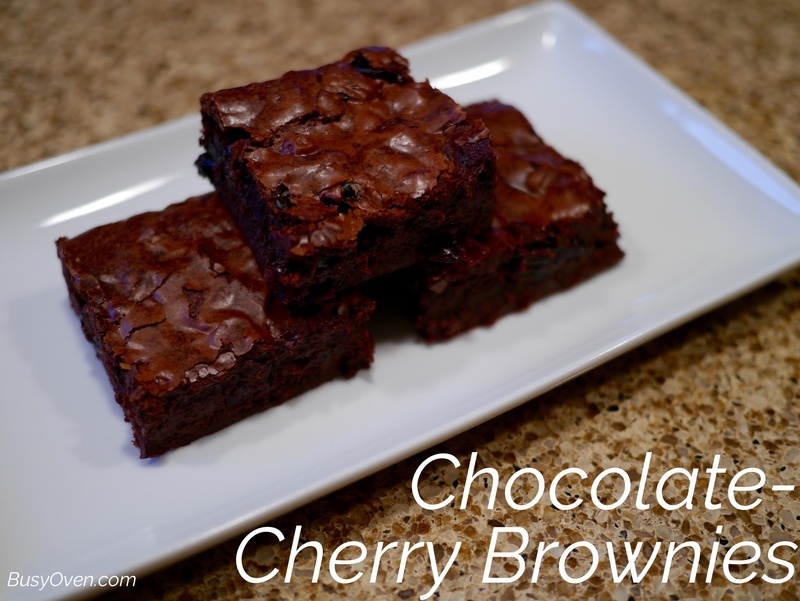 I would not have tried making these Chocolate-Cherry Brownies if it wasn’t for the Tuesdays With Dorie group. This recipe was not high on my list of recipes to try because I’m not a big fan of dried cherries. However, I was surprised that I liked the taste of these brownies more than I thought I would. The tartness of the dried cherries were subdued by the decadent chocolate. If anything, these should be called “Super Chocolatey Chocolate-Cherry Brownies.” This was definitely a fudgy brownie that chocolate lovers would appreciate. I was surprised at how little butter that went into this recipe: less than one stick. I also didn’t expect to see black pepper in the list of ingredients, either. The fun part was soaking the dried cherries in some wine and water. It was [sadly] entertaining seeing how much liquid was absorbed. In the end, they looked and smelled like like large drunk raisins. Let’s be honest: melting butter and chocolate was not as fun as soaking the raisins. Learning from prior mistakes, I lined up the remaining ingredients in the order they would be added to the melted chocolate. I was making one of my many batches of failed pastry creams one day and I forgot to add the sugar. Since then, I started making it a habit to line everything up in order of addition. First addition: sugar. Dorie was right when she said that the chocolate would get a little gritty. The eggs smoothed out what the sugar did. It made the chocolate smooth and shiny again. Then came the salt and pepper. Who would have thought? Flour was gently folded in, only enough that there were no more white streaks left. Then came my friends, the drunken cherries. And finally, extra chocolate for these Super Chocolatey Chocolate-Cherry Brownies. The batter went into a lined 8×8″ pan and then into the oven. Other people who made this recipe for Tuesdays with Dorie mentioned that they needed to leave their brownies in the oven for an extra amount of time, so I prepared myself for that. Surely enough, I needed to add another 15 minutes to my bake time. They turned out looking great! They had a nice flakey top and a nice fudgy center with lots of chewy and moist cherries inside. These were very tasty. I did get a hint of the port wine, but I did not detect any traces of black pepper. I love brownies but I think that if I make these again, I’ll know to cut them into smaller squares. You don’t need a lot to satisfy a chocolate craving with these brownies! Chocolate-Cherry Brownies recipe on page 322 of Baking Chez Moi.